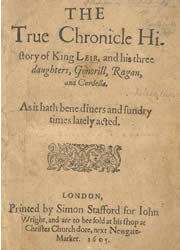 Oxfordian consensus is that the play is de Vere's earlier version of King Lear (e.g., Farina 202), in the same kind of relationship as Taming of A Shrew with Taming of the Shrew, or Romeus and Juliet with Romeo and Juliet, or Famous Victories with the Henry IV plays and Henry V.
The anonymous play No-body and Some-body, published in 1606, included among Shakespeare apocrypha but generally dismissed, contains many similarities to King Lear. This possibly Oxfordian play from the 1570s is discussed by Robert Prechter in "Somebody We Know Is Behind No-body and Some-body" [Th Shakespeare Oxford Newsletter 45.2 (September 2009): 6-10]. The recent passing of his wife has King Leir considering retirement after getting his daughters well placed. He'll divide his kingdom for dowries. A nobleman advises what Leir has already decided: since Leir has no male heir, to strengthen Albion, have the daughters marry "neighbor kings" (I.i.50). Cornwall already has expressed interest in Gonoril, and Cambria in Ragan. Cordella is committed to waiting for true love. So Leir's plan is to test which daughter loves him best; when Cordella insists she does, he'll spring the insistence then that she obey him and marry according to his choosing. One lord, Scaliger, will secretly inform the girls. Another lord, Perillus, anticipates the worst. Gonoril is already jealous of Cordella, that "proud pert peat" (I.ii.2). Ragan concurs: Cordella has no end of suitors, "And we must be set by for working days" (I.ii.18). Gonoril swears, "By my virginity, rather than she shall have / A husband before me, / I'll marry one or other in his shirt" (I.ii.25-27), even though Cornwall is already her match. Scaliger arrives with news and Ragan says, weirdly, "For God's sake tell us what it is, my lord; / I am with child until you utter it" (I.ii.35-36). He alerts them to the King's plan, and the two sisters gloat over their intentions to flatter the old man and exacerbate the inevitable rift with Cordella. The same to you I bear, my gracious lord. The sisters immediately scold her. Leir takes her response as disobedience and indifference. He will divide his kingdom between the other two and Cordella can consider herself disowned. Perillus laments the events, knowing that Cordella does love Leir but cannot use "vain flattering words" (I.iii.136). Based on glowing reports, the King of Gallia is determined to woo a daughter of Leir. "I will return seiz'd of as rich a prize / As Jason, when he won the golden fleece" (II.i.10-11). His man Mumford hopes to see if British girls really are fairer than French. They'll disguise themselves as lowly palmers. The King of Cornwall whines to his servant about how far it is to travel to court, as does a servant of the King of Cambria. The kings meet and exchange explanations concerning the letters they have from Leir about the daughters and the divided kingdom. Gonoril and Ragan smirk over their continued success at alienating Cordella from Leir. Leir commands that his lords not dishonor him "As to make shipwreck of our kingly word" (II.iii.42) by questioning his decisions thus far. He welcomes Cornwall and Cambria and announces the nuptial rites and the kingdom split. He will retire to his prayers and beads (II.iii.87) with Cornwall and knows Ragan will be disappointed with this. Perillus speaks up for Cordella but is chided by Leir. The lord laments, "Ah, who so blind as they that will not see / The near approach of their own misery?" (II.iii.106-107). The King of Gallia and Mumford, disguised as pilgrims, are sneaking around Britain, with Mumford forgetting to stop calling his king "My lord." Instead of Tresillus and Denapoll, the King's first choices, they'll go by the names Will and Jack. Cordella comes along, complaining about Fortune. Amid Mumford's saucy comments, the King finds himself in "labyrinth of love" (II.iv.46). At his urging, Cordella reveals the situation to Gallia. He tells her that a king craves her love, one "So like to me as I am to myself" (II.iv.93), but she insists she can reconcile herself with a life of poverty: "I'll hold thy palmer's staff within my hand / And think it is the sceptre of a queen" (II.iv.115-116). Gallia reveals himself, Cordella accepts him, they go off to marry, and Mumford says he wants a British woman. A woeful Perillus reports that Gonoril has been treating Leir shamefully. Gonoril complains to Scaliger about Leir being a meddling burden. Scaliger advises cutting his allowance. She already has "restrained half his portion" (III.ii.34), but she'll restrain the other half and he'll have to live elsewhere. Cornwall tries to cheer Leir but Gonoril is shrewish and advises Leir to get out. Perillus offers comfort as Leir bemoans his poor decisions. Hope is looked for in the other daughter, although Leir now demonstrates regret for disinheriting Cordella. Ragan gloats that she rules her husband, lives well, and isn't stuck with daddy. When he asks what happened to Leir, Gonoril tells Cornwall that Leir is visiting Ragan. Cornwall will send a letter to make sure he arrives safely. Gonoril will intercept the messenger in order to generate a pleasant report. "Thus with one nail another I'll expel / And make the world judge that I us'd him well" (III.v.43-44). She wishes Leir were dead but anticipates having to do some spin-control if Leir does go to Ragan and complains of his treatment while he was staying with Gonoril. The messenger gets money out of Ragan for letting her open the letter. He claims to have "as bad a tongue, if it be set on it, as any oyster-wife at Billingsgate hath! Why, I have made many of my neighbours forsake their houses, with railing upon them, and go dwell elsewhere; and so by my means houses have been good cheap in our parish. My tongue, being well whetted with choler, is more sharp than a razor of Palermo" (III.v.77-83). So here we get self-consciousness about railing instead of the supreme Shakespearean instance of it in action in King Lear. Ragan exchanges the letter for one she has written to her sister, claiming Leir has been insulting and slandering them both. A respectful and pious Cordella reflects on her fortunate life but for the loss of her father's love. Perillus and Leir hobble onwards. Ragan feigns courtesy and generosity but vows Leir will regret coming to her. The messenger brings Gonoril's letter to Ragan, who sees that he can be trusted. He assures her that murdering a man means very little to him. Ragan gives him money and makes an appointment with him to meet tomorrow. Cordella is depressed about Leir, despite the King of Gallia's kind and, for Shakespeare anyway, uncharacteristic advice: "Forget thy father and thy kindred now, / Since they forsake thee like inhuman beasts. / Think they are dead, since all their kindness dies, / And bury them where black oblivion lies. / Think not thou art the daughter of old Leir, / Who did unkindly disinherit thee, / But think thou art the noble Gallian queen / And wife to him that dearly loveth thee" (IV.iv.19-26). Cordella says she cannot help but mourn. "As easy is it for the blackamoor / To wash the tawny colour from his skin" (IV.iv.42-43). Gallia cheers her up by saying that he'll send to Cornwall requesting that Leir visit them. Ragan meets the messenger, who anticipates her desire: that he kill Leir. She says he must also kill Perillus. She'll lure them out into the thicket with ostensible news from Cornwall tomorrow morning. The messenger is to show Leir the letter from Gonoril before he murders them. Cornwall wonders why that messenger is taking so long. Gonoril speculates that maybe Leir is returning with him. An ambassador from Gallia brings letters to Leir, but he'll have to wait. Gonoril curses Cordella's fortune. Leir and Perillus are awake early and Perillus worries about being attacked by thugs: "these they call 'good fellows'" (IV.vii.10). They both fall back asleep though. The messenger steals upon them and considers killing them mercifully in their sleep, but he's supposed to show that letter. Perillus awakens and tells Leir his dream of the two sisters stabbing and hacking at him and Cordella afterwards healing him. The messenger accosts them and their money is inadequate. Leir refers "To me and to my Damon" (IV.vii.120) -- an unusual mention of Damon without naming Pythius -- and wonders if he was sent from France since it's from that quarter he deserves to be killed. But it was the other two sisters who hired this fellow, he swears. Leir doesn't particularly want to live now, but the messenger wavers in his resolve. "This old man is some strong magician" (IV.vii.196). Perillus expresses the same interest as de Vere in the latter's Geneva Bible annotations: "Oh, but beware how thou dost lay thy hand / Upon the high annointed of the Lord" (IV.vii.251-252). He notes that the women who hired him to kill their father wouldn't likely want him alive for long. And he'd go to hell. The messenger drops the daggers. Perillus advises that they not return to Ragan but go to Gallia to see Cordella. Leir doubts his welcome there. The Gallian ambassador resolves to venture to Cambria, having been treated abominably by Gonoril in Cornwall all this while. The King of Gallia looks forward to Leir's visit but Cordella fears her sister will dissuade him. Mumford insists that if he sees Britain again he'll not come back without his wench. After some bawdy exchanges and brief talk of fashion, the three decide to go down to the sea in disguise. Cambria wonders what happened to Leir. Ragan pretends to have premonitions and tries to pre-frame Cordella. Cambria expresses what the young de Vere had not yet given up on: "The heav'ns are just and hate impiety, / And will, no doubt, reveal such heinous crimes" (V.ii.30-31). The Gallian ambassador arrives and Ragan accuses his queen Cordella of foul deeds. "And, were it not it is 'gainst law of arms / To offer violence to a messenger" (V.ii.66-67), as Fluellen might point out and Antony ignore, ... but heck, she strikes the ambassador too, and persuades Cambria that Cordella is a threat. Perillus explains to two mariners that he and Leir were robbed and can't pay for sea-passage, so a clothes exchange covers it instead. Leir despairs of receiving any kindness from the daughter he spurned, but Perillus offers comfort as usual. Gallia, Cordelia, and Mumford, going about like country folk, encounter Leir and Perillus on their last legs like Adam in As You Like It. Cordella empties the food out of their basket for the two. Leir and Perillus are overcome with gratitude and offer their last doublet, but they won't take it. "And may that draught be unto him, as was / That which old Aeson drank, which did renew / His withered age and made him young again" (V.iv.95-97). Leir tells his sad story. At last, identities are revealed and Leir and Cordelia beg each other's forgiveness. Gallia vows to set things right against the "viperous sect" (V.iv.251). Mumford anticipates getting his wench. Ragan is troubled. She has never seen that messenger again, and what if Leir made it to France? She should have done it herself: "O God, that I had been but made a man" (V.v.15), "To give a stab or slit a paltry wind-pipe" (V.v.24) -- since "'Tis now undone" (V.v.28). Gallia leads an army to the sea and plans an invasion of Britain. Mumford gives a rallying speech. A captain gives watchmen their orders, but nothing ever happens so the watchmen plan to get drunk. Gallia, Mumford, and the soldiers are on the march. An alarum alerts unprepared captains. The watchmen enter, drunk, which explains why there was no warning of invasion. Mumford enters and wins a victory. Gallia gives a speech explaining that they want only to restore Leir to power. A nobleman speaks for the people in happy assent. Leir thanks his subjects. Cornwall, Cambria, the sisters, and their armies enter. The sisters still insult Leir, calling him a liar. Further insults are hurled about, including Gonoril calling Cordella "puritan" (V.x.68). Ragan snatches and tears up the incriminating letters and calls Leir senile. It's war. Cornwall bemoans the loss of the war, as all their friends revolt and join the other side. He and Cambria flee. Leir is restored to his kingship, but insists that Gallia accept it. Leir thanks Cordella, Perillus, and Mumford. Repose with me awhile and then for France.